That is a +1 mustache of gaming approval. Last night I finally found some time to really, really dive into The Banner Saga. I thought I would just nibble a bit before bed. And before I knew it, three chapters and the night were gone. I find myself eager to play, even now. The Banner Saga is a tall glass of tactical RPG we’ve sorely needed after the decade long feast of gorgeous-but-mundane AAA titles. Once I started, it was difficult to put down. The multi-player Banner Saga: Factions prepared me well for the combat, as I’ve yet to lose a battle. But there were plenty of surprises left in store for me. The enemy AI isn’t a slouch foe- not perfect but far from terrible. And I found myself perplexed and intrigued that every fight was effectively a tactical puzzle, complete with surprises and depth. I might be carving my way through weak thugs, then suddenly realize that there’s a wolf amongst the sheep. Or find myself surrounded, trying to manage foes to one side as swiftly as I can before dealing with the other half. There were new unit types to figure out, both on my side and against me. I found particular use for the spearman, a class whose extra ranged weapon pairs well in the corners when surrounded by varl or raiders, and I was really glad I pre-ordered the game and got my hands on crazy Tryggvi, a simple but valuable bonus. Stoic borrowed the shifting POV chapter approach of Game of Thrones or rather A Song of Ice and Fire. But unlike George R.R. Martin, the chapter only ever shifts just as it’s situation begins to heat up. We’re chugging along on chapter 1 and my attention is all over the place until a certain character has died (death, the ultimate attention getter). 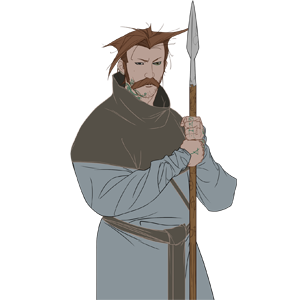 But before that is followed up, we shifted over to Rook and his daughter Alette, whose village was escaping a dredge attack. But just as they’re out of the frying pan and into the fire, we switch back to the varls of chapter 1, leaving me anxious to know what happens next to the father-daughter duo and their allies. The game is a true “page turner” if such a phrase could be applied to a game. Stoic’s approach to the adventuring and travel aspects is an intriguing and wondrous mess. As I marched along the road to my next destination, we occasionally run into problems. Sometimes it’s combat, which can be avoided or engaged. A risk in that one can gain promotions, items and reputation, but also lose men and expend supplies to recover post-battle. Other times its issues in the camp, such as dealing with the damage inflicted by a drunk, or people wanting to leave to warn passing farms of the coming dredge. These short but simple events are reminiscent of The Sims and I am curious of the underlying mechanics of if or how they effect the overall story. Rewards and losses vary from more reputation (the game’s currency), men or supplies or even items useful for your heroes. I don’t know yet how much of this is scripted or just random events that occur. These days, I have actively turned off reading wikis in order to be surprised and enjoy the simple delights of discovery. It always keeps me on my toes. Funny thing is, I can’t tell how I feel about the lack of voice acting during the game’s narration. Part of me almost prefers it, being able to read the story at my own leisure. But that’s the reader in me coming out. Voice acting would have given another layer of polish that most gamers would prefer.